Background: Despite a number of innovations in anti-diabetic drugs and substantial improvement in diabetes care, the number of people with diabetes continues to increase, suggesting further need to explore novel approaches to prevent diabetes. Type 2 diabetes (T2DM) is characterized by beta cell dysfunction and insulin resistance. However, insulin resistance, usually a consequence of obesity, is often emphasized and the role of beta cell dysfunction in T2DM is less appreciated. 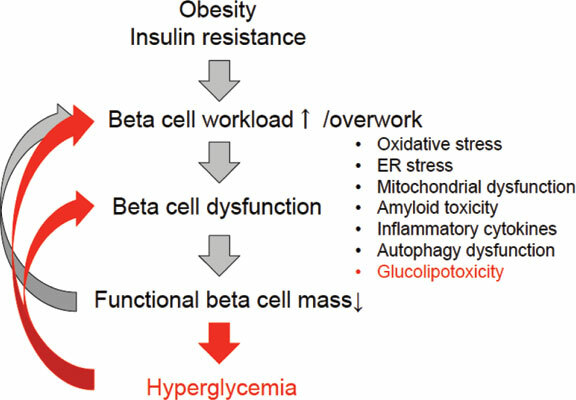 Objective and Results: This paper summarizes recent evidence showing the importance of beta cell dysfunction in T2DM and refines the “beta cell workload hypothesis”, emphasizing the importance of beta cell preservation for the prevention and management of T2DM. Conclusion: It is hoped that this novel concept will foster a better understanding of the pathophysiology of T2DM by not only medical staff and patients with diabetes, but also the general population, and encourage more people to adhere to a healthy lifestyle, eventually resulting in “stopping diabetes”. Type 2 diabetes, prevention, beta cell, lifestyle modification, empowerment, insulin resistance.